My dear friend and colleague, Rabbi Brant Rosen, has written a powerful interpretation of Lamentations Chapter 1. Tonight this will be my lament, a lament about what has happened to our people and a lament for the suffering of the people in Gaza. Hearing about corpses of children in Rafah that are being stored in ice cream freezers is an image that I can’t get out of our mind. In the words of our liturgy, What has become of us? Meh Haya lanu! This Monday night begins the Jewish fast of Tisha B’Av: a day of mourning for the calamities that have befallen the Jewish people over the centuries. Among other things, the traditional Tisha B’Av liturgy includes the chanting Biblical book of Lamentations. her cheeks wet with tears. with none willing to save her. As I mentioned in my earlier post, I am a member of Jewish Voice Peace and the Rabbinical Council of JVP. The Council has just issued the following statement. Please share with others. We are currently amidst “the three weeks” – the annual Jewish period of quasi-mourning that leads to the fast day of Tisha B’Av. This is the season that bids us to look deeply into the soul of our community and examine the ways that oursinat chinam – baseless hatred – has led to our communal downfall. Driven by the spirit of this season, we cannot help but speak out in response to the horrific loss of life currently taking place in Gaza, at the hands of the Israeli military. We deplore the Israeli government’s military crackdown in the West Bank that led to its lethal, military onslaught on the people of Gaza. We mourn the deaths of hundreds of innocent people, including children. We condemn Hamas’ rockets attacks on Israel and are deeply grieved by the anxiety, injury and death they have caused. But we cannot view this as a war between two equal sides. Israel has unlimited hi-tech weaponry; it dominates Gazan airspace, its borders, its utilities and economy. Moreover, it was Israel who willfully launched this mission of death on the Palestinian people. Israel hides behind the pretext of avenging the still unsolved kidnapping and killing of three Jewish boys. Rather than seeking recourse through civil, legal means, Israel’s leaders have called for vengeance, with terrible consequences. We can not stand idly by as the Jewish State acts with such wanton disregard, with such sinat chinam, for the humanity of the mothers, fathers, sons, daughters, brothers, sisters, children and elders of Gaza. As Jews, we abhor the abuse of human rights that are standard practice of our fellow Jews in the Israeli government and Israeli military. This is not the path of justice. As rabbis, we must speak out against collective punishment, the blowing up homes of innocent people, the terrorizing of an entire people, and the killing of innocent children. This Jewish season asks us to engage in a collective moral accounting; to reckon seriously with the ways our own failings have historically led to our communal downfall. Mindful of this spiritual imperative, we call upon the government of Israel to end its military onslaught, which we believe will only lead to more tragedy for Jews and Palestinians alike. We stand with all people of conscience who reject the ways of militarism and occupation and who seek a path to a truly just peace in Israel/Palestine. In two weeks time on Tisha B’Av (9th of the Jewish month of Av), Jews will read the Book of Lamentations, a bitter lament about the fall of Jerusalem and the destruction of the Temple some 2,000 years ago. Over the past few weeks, I have felt a lament welling up inside my broken heart. Eicha/How? or Alas! is the first word of the book of Lamentations. How have we, as Jews, come to the point where the state that claims to be acting in the name of our people and our ethical and historical legacy has killed, as of today, over 650 Palestinians, the majority of them innocent civilians, 160 of them children? How do we, as Jews, face ourselves as we see the bodies of entire families in body bags, often just plastic bags, human beings that have been killed by jet fighters, tanks and navy ships of the fourth strongest military force in the world acting in the name of the Jewish people? How do we face ourselves as we see people fleeing on carts and by foot, images that remind us of Jews in earlier times fleeing for their lives, trying to find shelter somewhere from the barrage of armaments unleashed against them on all sides? The answer that is repeated over and over again is that Israel has the right to defend itself against the rockets launched into Israel. Over 1,500 rockets have been launched into Israel, killing, as of this date, 2 people. The rockets are a terrifying attack on civilians and any country has the obligation and right to defend itself against such an attack. Every day Israelis hear sirens and scurry to shelters and safe spaces. Everyone, especially the children, are traumatized by living with this threat of imminent danger. The bottom line is that this is not a war of defense. This assault is a war of choice by Israel with the goal of maintaining the occupation of the West Bank and the siege of Gaza and no matter how brutal, it will not bring safety and security to Israel. The only path to safety and security is a negotiated settlement with the Palestinians that ends the occupation of the West Bank and siege on Gaza, something Israel has steadfastly rejected. Just a few days ago, Prime Minister Netanyahu indicated that Israel would never withdraw from the West Bank and never allow the creation of a sovereign Palestinian state. Since before the founding of the State of Israel, Israel has believed that the Palestinian claim to their homes and homeland can be defeated by military might. This has been the underlying reason for all of Israel’s wars. In 1956, in a famous eulogy by General Moshe Dayan for a young kibbutznik named Ro’i Rotenberg, killed by Gazans who had crossed over the border into Israel, Dayan articulated this position. It is this same belief that underlies this latest assault on Gaza, a territory that has been under Israeli siege for 8 years and has been brutally attacked three times in the past six years. It is not a coincidence that the majority of Gazan residents are refugees or the children and grandchildren of refugees from the 1948 war. There is no military solution to the Israeli/Palestinian conflict. The only solution is a negotiated settlement. Again, so what about the rockets? Israel has the right to defend itself. I have compassion for the fear of the Israelis and all those traumatized by the rockets and the sirens. Twice in my life I have been in Israel during the time when we had to run to shelters because of rockets; during the Gulf War and another a month before the Israeli assault in 2008 (Operation Cast Lead). I know in my bones how terrifying it is to hear those sirens and to run for cover. However, I believe there is no moral equivalence between the firing of rockets by Hamas and other militants in Gaza and the Israeli assault. Gaza is a land and people living under Israeli siege since 2007. There is a myth that Israel “withdrew” from Gaza and allowed the Gazans freedom. Nothing could be further from the truth. While Israel withdrew their settlements from Gaza in 2005 and the military force that protected them, in 2007 they placed a blockade on almost all exports and imports and on the movement of almost all Gazans. Sara Roy, an economist at Harvard, has documented how the siege has impoverished the people of Gaza creating an entire population that is dependent on aid and has no means to develop its economy. For a time, the Israelis even put Gazan’s on a “diet” controlling the amount of food they allowed into Gaza according to the number of calories that they deemed each Gazan would need. There is no equivalence between the resistance of the occupied, which is an internationally recognized human right, and the assault of the occupier, the fourth strongest military on the planet. While the Israelis are certainly suffering profound losses in this conflict, they are ultimately the occupier and oppressor. There is also abundant evidence that this current war in Gaza is a war of choice. The prominent Jewish journalist, J.J. Goldberg, a life-long committed Zionist, recently wrote an article in the Jewish Forward describing how Israel used the kidnapping of the three teenagers to launch an attack on Hamas on the West Bank. Fearing the Palestinian unity government between the Palestinian Authority and Hamas established after the failure of the peace process, Israel manipulated the kidnapping to launch an attack on Hamas. Israel knew the teenagers had been killed yet it hid that truth and launched a “Bring our Boys Home” campaign all over the world. It launched an assault on Hamas on the West Bank arresting many of its leaders who had been freed in the exchange for Gilad Shalit, attacking its institutions on the West Bank and killing six Palestinian leaders. For the most part Hamas had maintained the ceasefire agreement of 2012 and Israel violated it. There were no rockets from Gaza until these unprovoked attacks on Hamas by Israel even though there was, and still is, no evidence that the kidnapping was the work of Hamas. You may also want to read the article by my colleague, Rabbi Brant Rosen and the article by M.J. Rosenberg who at one time worked for AIPAC. Listening to Netanyahu’s defenders in the media (and that is pretty much all you get as objective reporters are yanked off the air), I’m struck by how Americans are indoctrinated into ignoring the most significant fact about Gaza. It is under Israeli occupation (now called blockade) and has been since 1967. That is the cause of the “war.” Yes, Israel has the “right” to defend itself but Palestinians have the “right” to resist occupation. Those conflicting rights are leading to perdition and, in my opinion, the loss of the Israel many of us have loved and identified with our entire lives. The oft-proclaimed Gaza withdrawal was a fraud. Although Israel pulled the settlers out, it has maintained a blockade of Gaza ever since, blocking its air, sea, and land borders, locking its people in a giant prison. I wish we could say, “this is not our problem, let the Israelis and the Palestinians sort it out.” Unfortunately, it is directly our problem as it is our government that provides the military, diplomatic and financial support for Israel. And it is my community, the Jewish community that plays a major role in ensuring the unconditional support of our country for Israeli government. Two days ago, the Senate voted unanimously (including the most liberal Senators including mine, Senator Elizabeth Warren) for an AIPAC sponsored resolution in support of Israel’s actions without a single reference to the suffering of the Palestinians! As Americans and as Jews, we are directly complicit in the oppression of the Palestinians. So where are the prophetic voices in the Israel and in the Jewish community? There are very some brave Israelis who have demonstrated against the assault. They are the moral heroes fighting for the soul of our people. They have been attacked physically by thugs incited by Netanyahu and other members of the government, the same thugs who roam the streets looking for Arabs they can attack. You can read Rabbi Rosen’s blog post on this frightening phenomenon here. The prophets teach us that the only source of security is justice and love. The prophets of our time are not to be found in the mainstream Jewish community, they are to be found on the streets of America and the streets of Israel. At great cost, they courageously speak truth to power, calling for a negotiated settlement to the conflict based on justice, dignity and love for everyone who lives in Israel/Palestine. It is ultimately the only way both Israelis and Palestinians will find security. 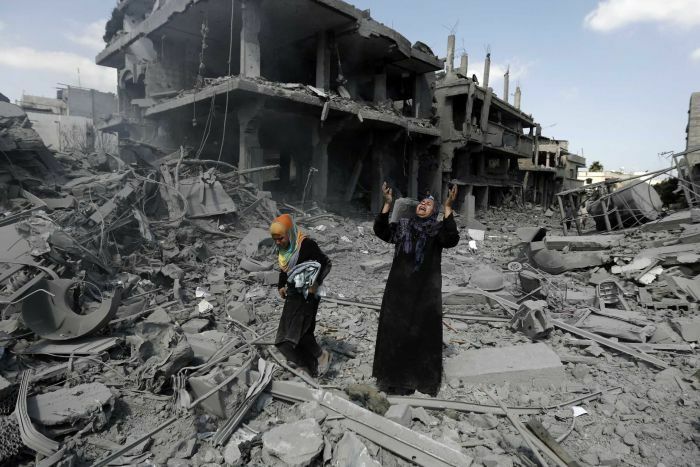 Every day brings another horrifying series of images and reports about the suffering in Gaza. Today was another such day. Every day also brings images of people in our country, in Israel and around the world, protesting the Israeli assault. May our lament turn into a commitment to bring pressure to bear on Israel to turn from the suicidal path it has chosen. The Forward just published a brilliant article by two young Jewish leaders about the suspension of the Students for Justice in Palestine chapter at Northeastern University. I encourage you to read it and to support the struggle against the censorship of voices that challenge Israeli policy on campus. What an important article. I hope many Jews, young and old, take it to heart. Yishar Kochachem/May you be blessed with strength! Hirsh Goodman, an Israeli journalist who grew up in South Africa, wrote an op-ed, “Losing the Propaganda War,” in the Review section of the New York Times on Sunday. His piece was included to “balance” the groundbreaking inclusion of an article by Omar Barghouti, a leader of the Palestinian Boycott, Divestment and Sanctions (BDS) movement. There are many South African Jews who made aliya to Israel who claim that Israeli policy in no way resembles Apartheid. Yet, like Goodman, they acknowledge that the moment the two state solution is no longer an option – when will that be? – it will immediately become a situation of apartheid! On the other hand, I encounter countless Jewish South Africans – especially those who were active against apartheid – who on visiting the the West Bank feel apartheid in their very bones. I am in this category and felt compelled to write a response to Goodman. Please share this piece with others. I am especially interested in hearing from other South Africans who have actually spent time in Palestinian villages and towns on the West Bank. After decades of arguing that Israel is not an apartheid state and that it’s a calumny and a lie to say so, I sense that we may be well down the road to being seen as one. But of course, Goodman misses the point: the issue is not about “branding,” nor about “inexplicable” actions by Israel. Quite the opposite, the painful truth lies at the core of Zionism itself: a systemic privileging of Jews over non-Jews and an ongoing structural injustice that Israel inflicts on the Palestinian people. It is this painful truth of very explicable – albeit unjust – policies of Israel, so similar to those of apartheid South Africa that has led so many to view Israel as an apartheid state. The confiscation of vast tracts of Palestinian land, discriminatory zoning practices that restrict Palestinian housing while towns with thousands of homes are built for Jews, the creation of huge exclusive Jewish settlements on the West Bank, intense restrictions on freedom of movement, imprisonment without trial, the arrest of children in the middle of the night – these are only some of the discriminatory policies reminiscent of the injustices that Goodman and I witnessed as young people growing up in South Africa. Because of our deep bonds to the culture and people of Israel, it is so hard for liberal Israelis, such as Goodman, and American Jews such as myself, to acknowledge this painful reality. It has taken me years to acknowledge this truth and years to overcome the fear of saying it out loud – a fear that still inhibits me. Decades of activism as a progressive Zionist gave me the opportunity to see realities that most Israelis such as Goodman never see, except as soldiers. My life changed forever the day I walked down Shuhada Street in Hebron, a street that is restricted to Jews, where the Palestinian residents are forbidden to even walk on the road on which they live. I wept that day, knowing that I could no longer be silent when people warned me not to mention Apartheid when talking about Israel. I have passed through checkpoints on the West Bank and have seen Palestinians, herded like animals, waiting for hours for their identity cards to be checked. I have stood on the ruins of demolished Palestinian homes where one can see vast new Jewish neighborhoods that are within a short distance. I am grateful to my Israeli human rights activist friends who allowed me to see these realities with my own eyes. And I am grateful to the Palestinians who welcomed me into their homes and villages to share their lives with me. As a person who grew up in South Africa it is impossible to see such realities not to feel the similarity with Apartheid in your very bones. South African anti-Apartheid leaders who have visited the West Bank immediately see the parallel. It is impossible not to. This is not to say that the situation in Israel and apartheid South Africa are identical. There are important differences. Jews have a profound long time connection with the land of Israel. Israel saved the lives of many Jews at a time when our people were among the most desperate people on earth. In many ways Israel represents a miracle of rebirth for Jews. Yet our attachment to Israel and what it represents can never justify the dispossession of 700,000 Palestinians in 1948 and the creation of Jewish villages, kibbutzim and towns on the ruins of destroyed Palestinian villages. Nor can it justify the continuation of this policy of dispossession on the West Bank that has made even a two-state solution a near impossibility. Israel is not losing a “propaganda war” – rather, the Jewish people and Israel are in danger of losing our very soul. The most precious elements of our heritage and historical experience have been threatened. This is a spiritual emergency for Jews in Israel and around the world – an emergency that cannot be solved by mere “branding” or by accusing those involved in the Boycott, Divestment and Sanctions (BDS) movement of anti-Semitism. Many Israelis and American Jews support some form of BDS as a strategy to end Israeli oppression. Some advocate boycotting settlement products, others support wider boycotts, divestment initiatives and government sanctions. All those involved in BDS view it as a nonviolent strategy to end the systemic injustice and discrimination that Israel inflicts on Palestinians. I am part of a growing group of American rabbis, members of the Jewish Voice for Peace Rabbinical Council who support BDS. While we have differences between us on what initiatives we may support, we all participate in some form of BDS because we believe that Israel and everything we hold dear about our Jewish legacy is threatened by the policies of Israel. As a South African, I experienced the effects of the boycott against South Africa. I was disappointed when international rugby games in Cape Town or favorite concerts were cancelled because of the boycott. Yet, as a South African opposed to Apartheid I welcomed the activism of those outside the country engaged in this struggle for justice. Like South Africa, Israel has outlawed support for the boycott in any form. Thankfully, there are some courageous Israelis – however small in number – who are prepared to defy the law. Now that Israel has the most right wing government in its history that is unlikely to take even minimal steps towards peace, Hirsh Goodman fears the boycott and the comparisons to South Africa. By portraying those who support the boycott as anti-Semitic, he is no different from the the Israeli government and American Jewish institutions that wish to intimidate and silence those who stand in solidarity with the Palestinian demand for equal rights and human dignity. Unfortunately, this issue is not about anything as trivial as a “Gucci” bag, or a brand name. It is about ending systemic discrimination and oppression and about the struggle for dignity and human rights for all. As a rabbi and a long-time Oxfam supporter, I find Johansson’s decision to support a company exploiting Palestinian workers living under decades of occupation, expropriating Palestinian land at favorable tax rates, and setting back the prospects of a just resolution to the conflict to be.profoundly disturbing. Johansson’s decision to serve as the brand face for SodaStream, a company based in an illegal Israeli settlement, is shocking. How could a global ambassador for Oxfam, a celebrity who has shed light on suffering and poverty around the world, be the face of a product created in an illegal Israeli settlement? How can she justify being the face for a company that profits from the brutal Israeli occupation? Not only did Johansson agree to a contract with Soda Stream, but she also recently defended her decision by claiming that SodaStream is a company that is “building a bridge to peace between Israel and Palestine, supporting neighbors working alongside each other.” Although this is SodaStream’s official claim, nothing could be further from the truth. This is an excerpt from the beginning of an opinion piece that has been published by Alternet. You can read the complete piece here. Over the past week I have heard and read a lot about Ariel Sharon – much of it either minimizing, avoiding, or ignoring the war crimes he committed. One piece that presented an honest and very informative appraisal of Sharon’s life is an interview by Amy Goodman of Rhashid Khalidi, Palestinian scholar; Avi Shlaim, Israeli historian; and Noam Chomsky on Democracy Now. I recommend listening to the whole interview. I was particularly struck by Professor Chomsky’s comment that the Kishinev pogrom in Russia in 1903, a very painful and significant event in Jewish history, was a replica of the massacre at Sabra and Shatila. Well, the Kahan Commission did condemn Sharon for what they called “indirect responsibility” for Sabra-Shatila massacre. The Kahan Commission, I think, was really a whitewash. It tried to give as soft as possible an interpretation of what was in fact a horrifying massacre, actually one that should resonate with people who are familiar with Jewish history. It was almost a replica of the Kishinev massacre in pre-First World War Russia, one of the worst atrocities in Israeli memory, led to a famous nationalist poem by the main Israeli poet, Chaim Nahman Bialik, “City of Killing.” The tsar’s army had surrounded this town and allowed the people within it to rampage, killing Jews for three days. They killed 45 people. That was—that’s pretty much what happened in Sabra-Shatila: Israeli army surrounded it, sent in the Phalangist forces, who were obviously bent on murder. AMY GOODMAN: These were the Lebanese Christian forces. NOAM CHOMSKY: Lebanese Christian terrorist force, allied with Israel. The soldiers watched as they illuminated it. They helped them enter. They watched for several days while they murdered, not 45 people, but somewhere—Israel claims 800, other analyses go up to several thousand. That’s the Sabra-Shatila massacre. The idea that Sharon had indirect—the tsar, incidentally, was bitterly condemned internationally for direct responsibility. That’s, in fact, one of the events that set off the huge flow of refugees from Eastern Europe, including my father, among others. But—so this was a kind of a replica, except far more brutal and vicious. And Sharon escaped more than a mild censure. It’s true that he was removed as defense minister, but it wasn’t long before he came back. And that’s one of a number of extremely shocking incidents in his career. You can listen to Professor Chomsky’s comments here starting with some comments by Professor Shlaim at 30:00 minutes. As Professor Chomsky points out the Kishinev pogrom had a very significant impact on Jewish history. It set off a huge flow of refugees, among them his father, who came to the United States. Bialik’s famous poem that rails against the passivity of the Jews in response to the violence led to the formation of Jewish self-defense groups, strengthened Zionist activity and significantly increased emigration to Israel. Bialik actually got it wrong. The Jews in the town did resist physically but were overpowered by a force much stronger than them. The shame that Jews felt in response to reports of Jewish passivity in the face of anti-Semitic violence is an important theme in Zionism. Sharon embodied the Zionist response to this shame: the reliance on Jewish military strength to protect Jews, to create a Jewish state on the land of Palestine, imposing their will on the native inhabitants. Sabra and Shatila was not the only massacre for which Sharon bears responsibility. In 1953 he was the commander of a special force, Unit 101, that massacred sixty-nine Palestinian residents of Qibya. (A little more than a year ago, I met some residents of Qibya at a gathering in Budrus of residents of Palestinian villages engaged in nonviolent resistance to the confiscation of their land.) Both massacres were based on his belief, rooted deeply in Zionist ideology, that the only way to ensure the survival of Israel is by brute force. This belief that was challenged by Judah Magnes and some others in the Zionist movement who understood that the only way to peace was through negotiation and shared agreement between Jews and Palestinians. Unfortunately, their view was rejected and it is the worldview represented by Sharon, with all its brutality, that drives the policies and actions of Israel. It is nothing less than tragic that Jews end up creating “replicas” of our past: doing to others exactly what was done to us. *Amy Goodman’s interview also includes a very moving report by Ellen Siegel, a Jewish nurse who was working in hospital in Sabra refugee camp at the time of the massacre. Judge Richard Goldstone has written a moving reflection on Nelson Mandela’s relationship to the Jews of South Africa. You can read it here. I want to highlight that while Madiba had a close relationship with the activist Jews who were such an important part of the anti-Apartheid struggle, the overwhelming majority of South African Jews and our communal institutions were shamefully silent about Apartheid. We benefited from the privileges we enjoyed as whites and implicitly supported the brutality of Apartheid by our silence. This is a deeply troubling aspect of the history of the Jews in South Africa that must be acknowledged along with the recognition of the profound role individual Jews – for the most part disconnected from mainstream Jewish institutions – played in the struggle against Apartheid. Mandela was deeply grateful to everyone who supported the A.N.C. in its struggle, including Yasser Arafat and the P.L.O. When Western countries expressed their displeasure with his relationship to Arafat, he steadfastly expressed his deep gratitude to Arafat and all those who supported the anti – Apartheid movement. Another important piece of this puzzle is that in the 1970’s and 80’s Israel became the main supplier of arms and military training to the South African military as they brutally suppressed the struggle of the black majority for justice, equality and human rights. This is another profoundly shameful and troubling aspect of the relationship of Jews to Apartheid. It is in the face of the implicit support of Apartheid by the overwhelming majority of South African Jews and Jewish institutions and the massive Israeli military assistance to the Apartheid regime, that we highlight the courage and moral vision of those individual Jews who supported Mandela and the struggle. In June this year, when Nelson Mandela was critically ill, my daughter and son-in-law, Chana and Lincoln, named their second child, Micah Mandela Ritter. I am reminded today of how moved I was my grandson’s covenant ceremony when they announced his name. On Yom Kippur this year, in honor of Mandela I gave a sermon in part addressed to my grandson, Micah Mandela, on what we could learn from the great man whose name he bears about justice and moral vision, compassion and forgiveness, and about hope, community and social transformation. On this sad day of his passing, I offer these words in memory of a great man who so profoundly changed our lives and inspired us. I grew up in Cape Town, one of the most beautiful cities in the world. My family’s home was in Sea Point, a suburb that lies between the mountain and the ocean. Our home, number 14 Queens Road, was just a few houses from the ocean. If you looked up the road you could see the mountain; in the other direction, the ocean. The natural beauty that surrounded us was nothing less than spectacular: miles of oceanfront in both directions, lush vegetation, gorgeous flowers and the mountain in the background. In Habonim, my Zionist youth group, we sang, “We come from Cape Town, land of sea and mountain!” Yes, we lived in a spectacularly, beautiful place, “a land of sea and mountain” and much more. Our family loved to go for walks on the beachfront. We would pass swimming pools, restaurants, playgrounds-all restricted to whites. The only people of color allowed to live in our neighborhood were domestic servants who lived in separate servants quarters. Blacks who worked in Sea Point lived in townships far from the city; they came in during the day to work and had to carry a pass book confirming that they had a job in our area. On clear days, we could see an island in the distance: Robben Island, the prison where Nelson Mandela and many of his African National Congress comrades were imprisoned for decades. The gulf between our comfortable and glorious suburb and the prison island we could see with our own eyes was enormous. It seemed unbridgeable. That tragic gap reflected the gulf between the reality of most white South Africans and that of majority of the people who lived in South Africa. At that time it was illegal to quote Mandela or to print a photograph of him. Merely mentioning his name could make one the subject of suspicion. White South Africa and the Western world, including the United States, considered him persona non grata. He was a “communist” and a “terrorist.” The United States never took Mandela off the terrorist list till 2008 and kept the A.NC. on the list but made it possible for the status to be waived at times. It was clear that if there were to be peace in our country it would involve freeing Mandela from prison, legalizing the A.N.C., and entering into negotiations. When I was growing up this seemed beyond any possibility. We all feared that our country was on the road to a massive and bloody civil war. In June, when Chana and Lincoln, my daughter and son-in-law, announced at the naming/covenant ceremony that the name of their second child would be Micah Mandela Ritter, I was deeply moved. I never imagined that I would be blessed with a grandchild named Mandela. I feel so blessed to be the zeyde (grandfather) of a child who carries the name of a moral hero of our time, a man who has been central to my own life and has inspired me in so many ways. and third, about hope, community and social change. These lessons are directly relevant to us this day as we reflect on our lives, our own moral vision and issues of forgiveness and change. Many of us are the beneficiaries of economic and racial privilege and live in a country with a history not so different from South Africa. The Torah commands us: “Justice, justice shall you pursue!” The prophets of our tradition call us to justice. “Let justice well up like water,” says Amos. “You know what God has commanded you,” says Micah, “to act justly, love kindness and walk humbly.” The prophetic tradition which is the core of Reform Judaism and much of liberal Judaism puts justice at the center of our religious vision. Nelson Mandela, although he is not religious, is in the line of the prophetic tradition. His life was devoted to justice and guided by a clear moral vision of a democratic country, a non-racist South Africa, where all people would enjoy equality, dignity and justice. In 1963, when I was 11 years old, Mandela was convicted along with 10 of his comrades, five of whom were Jewish, in the Rivonia Trial, which ended with Mandela sentenced to life imprisonment. In a moving statement at the trial he articulated this moral vision. First, he described the injustices Africans suffered and what they deserve. “Africans want to be paid a living wage. Africans want to perform work which they are capable of doing, and not work which the government declares them to be capable of. Africans want to be allowed to live where they obtain work, and not be endorsed out of an area because they were not born there. Africans want to be allowed to own land in places where they work, and not to be obliged to live in rented houses which they can never call their own. Africans want to be part of the general population, and not confined to living in their own ghettoes. African men want to have their wives and children to live with them where they work, and not be forced into an unnatural existence in men’s hostels. African women want to be with their menfolk and not be left permanently widowed in the reserves. And then he articulated the most important demand. “Above all, we want equal political rights, because without them our disabilities will be permanent. Mandela’s vision of a “democratic and free society in which all persons live in harmony and with equal opportunities” was not only Mandela’s personal vision; it was the vision of a broad movement that was articulated in the Freedom Charter. In 1955 the African National Congress sent 50,000 volunteers out into the countryside to ask people what freedoms they wanted. Based on this, they drafted the Freedom Charter, which was then adopted by the multiracial South African Congress Alliance. “We the People of South Africa declare for our country and the world to know that South Africa belongs to all who live in it, black and white, and that no government can justly claim authority unless it is based on the will of all the people.” The document includes demands for basic human rights (many of which are still not part of the moral vision of the United States): a forty-hour week, equal pay for equal work, a national minimum wage, free compulsory universal and equal education for all children, universal health care. The document is so inspiring. Most of it, except for the clauses that deal with nationalizing industry or redistributing land, was incorporated into South Africa’s extraordinary constitution in 1996. Mandela’s vision was not based in any religious tradition, but it is consonant with the central core values of all religion as we understand it: that each and every human being is a child of God entitled to dignity, equality and justice. Mandela pursued this moral vision relentlessly and at enormous personal cost. When he was offered a deal that would free him but would not guarantee voting rights, he chose to remain in prison and did not emerge until that most basic demand was met. Mandela’s dedicated commitment to justice was integrated with a profound compassion for all people, even his enemies. This is evident in his unrelenting commitment to a non-racial democracy but also in his greatness of spirit and the forgiveness with which he approached his white oppressors. This is best exemplified in two stories about his relationships to those his enemies and those who supported him. “The time for the healing of the wounds has come. On that inauguration day, one of the guests of honor who received a personal invitation from the new president was a man by the name of James Gregory, one of Mandela’s jailers on Robben Island. Gregory worked there for nine years, from 1967 till 1976. When he was transferred to Cape Town, he continued to censor the letters of inmates on the island. Later he was transferred to Pollsmoor prison, and when Mandela and four other A.N.C. leaders were transferred there, Gregory was assigned to Mandela. Gregory talks about his extraordinary relationship with Mr. Mandela during this period of time. What extraordinary forgiveness! To forgive those who have served as your jailers. What a powerful story for this day of forgiveness when each of us is called to ask for and grant forgiveness. Can we forgive those who have hurt us? Will we? Alan Brigish, a friend of mine who lives on Martha’s Vineyard and who also grew up in South Africa, tells another extraordinary story about Mandela. His father, Harry Brigish, gave Mandela a job as a law clerk in 1947 . In 1999, Mandela’s final year as president, Alan took his dad to the doctor who told him that the President had asked him about his father and wanted to see him. Alan immediately called Mandela’s and left a message that he was Harry Brigish’s son and that he had been told the president wanted to see him. He wanted to let him know that Harry would love to see him. A day later, six cars arrived at the apartment block and Mandela came over for a cup of tea. Alan’s mom asked the president what he was going to do now that his term of office was over. “I am going to be doing much the same as what I am doing now. I am going to find the people who helped me and meet with them to thank them personally and I am going to find the people who hurt me and meet with them and forgive them face to face.” What compassion! What humility! What menshlichkeit! Do we have the same capacity to thank those who have loved and helped us and to forgive those who have hurt us? Growing up in South Africa, it was hard to imagine any future other than a massive civil and racial war in which thousands of people would be killed. And yet the determined resistance of millions of South Africans and people around the world made possible what seemed impossible. The apartheid government, facing mounting pressure from the resistance inside the country and from those around the world engaged in boycott, sanctions and divestment, decided to free Nelson Mandela and the other leaders of the resistance and to negotiate with them. The relatively peaceful transfer of power in South Africa was nothing short of miraculous and it is a source of great hope for all who seek social change. Social change takes a long time and demands huge devotion, courage and many sacrifices, but it is possible. Mandela and the movement he led always held to their moral vision and their belief that change could and would happen. What we can learn is that change is possible when people join together in movements to make change. There is an extraordinary seven-part documentary made by Connie Fields, Have you heard from Johannesburg, that describes how actions in the country and around the world engaged in boycott, divestment and sanctions against South Africa made that happen. And so, my dear Micah Mandela: the man after whom you are named is a winner, a dreamer who never gave up. I hope carrying his name brings you blessings in your life: the blessing of living your life according to a moral vision of justice, your heart filled with compassion for all people, always offering forgiveness. A life of hope, that you always know deep in your heart that people joining together can make a difference in the world. I hope you find your particular way of joining with others to make our world a more just and decent place, and the blessing of honoring the prophetic voices of your Jewish legacy, your own prophetic voice and the prophetic voices in your world. Always remember the Jewish prophetic legacy that you have received as a gift. Remember what the prophet Micah taught us all. It is not complicated. This is my blessing to you and to all your buddies, the next generation who will inherit this world. Let freedom reign. God bless Africa. And let us add: May God bless us all. May we all be sealed for a sweet, joyous and healthy new year. And today I add, his memory will always be a blessing to us. May his soul be bound in the bond of life and may he rest in peace. The Dorothy Cotton Institute Civil and Human Rights delegation to the West Bank have just sent a letter to Morgan Freeman urging him to decline an award from the Canadian Friends of the Hebrew University. Below you can read the letter and I urge you to join 8,000 others who have signed a letter organized by the US Campaign to End the Israeli Occupation. You can sign here. Your letter will be received instantly and also delivered directly to Mr. Freeman. from the Dorothy Cotton Institute 2012 Civil And Human Rights Delegation to the West Bank. We are writing to you as members of a historic delegation of twenty three leaders from the nonviolent U.S. Civil Rights movement of the 1950’s and 1960’s, younger civil rights and human rights leaders, peace advocates and educators, who traveled to East Jerusalem and the West Bank in October last year, to meet with leaders of the Palestinian nonviolent resistance movement and their Israeli allies. During our trip, we witnessed for ourselves the injustice and violence of the Israeli occupation, and the suffering inflicted on the Palestinians, in violation of international law and UN resolutions. For many of us, the systemic discrimination on the West Bank reminded us of the Jim Crow South. Our experience on the West Bank compels us to join with so many others who have urged you to decline the Key of Knowledge Award from the Canadian Friends of the Hebrew University for your work in “combating segregation and prejudice, and promoting knowledge and education throughout the world.” We honor your work in combating segregation and prejudice and it is precisely because of this work that we urge you to decline this award. By accepting the award you will implicitly legitimate Israel’s continued policies of oppression and discrimination on the West Bank. During our trip we met countless courageous Palestinian nonviolent activists and their Israeli allies who are putting their very lives on the line in the struggle for basic human rights. These folk welcomed us into their homes and villages and shared their story with us. They inspired us and they asked us to do all we can to bring pressure to bear on Israel to end their policies. By declining the award you would be adding your voice to those of Nelson Mandela and Archbishop Desmond Tutu who have consistently stood in solidarity with the struggle of the Palestinians for justice and human rights. You would also be joining Stevie Wonder who declined to sing at a fundraising gala for the Friends of the Israeli Defense Forces last year. Dr Martin Luther King Jr. said, “our lives begin to end the day we become silent about things that matter.” An end to Israel’s 45-year occupation of the West Bank matters. Equality, security and human rights for everyone matters. The future of the children of Israel and Palestine matters. By declining this award you have the opportunity to say that all this matters. We trust that you will carefully consider this request and we hope that you will decide not to be silent. We who have seen with our own eyes cannot be silent, and we hope that you will use this opportunity to make your own statement in support of justice and dignity.  Dorothy Cotton, Associate and colleague of Dr. Martin Luther King Jr., a member of hisexecutive staff, and Education Director of the Southern Christian Leadership Conference.